I used to love the iPhone’s Notes app for its simplicity and speed. It had problems—sometimes links would appear where they didn’t belong, and sync was flaky—but it got better over time. And its design was just enough of the right things: the note’s title wasn’t a separate piece of data, it was simply the first line of the note; starting a line with an asterisk turned it into a bulleted list. Small touches like that made it great, but unfortunately a couple of months ago it became pretty unusable for me. The upgrade to iOS 11 and MacOS High Sierra made it so slow that it was nearly unresponsive. I was forced to search for a lightweight replacement. I was strongly biased towards something that was little more than plaintext with a WYSIWYG interface and sync between devices. One ideal choice would be a Markdown editor that stores its data in Dropbox or similar. But I need it to work on my phone, iPad, and laptop. With that in mind, I first searched for barebones, minimalistic note-taking and research apps. One option I considered briefly was using plaintext and GitHub, and letting Git be my syncing strategy. This would be more complex across mobile devices than I was willing to contemplate, however. IA Writer. This is more of a writing tool than a note-taking tool, with features for readability analysis and the like. It’s also plaintext-only, and doesn’t support images. I have owned it for a while, but it’s really not for storing and organizing one’s digital life; it’s for becoming the modern Hemingway. Ulysses is similar: it’s a writer’s tool, not for an information packrat like myself. Byword was more along the lines of what I was looking for at first. It’s a Markdown editor with cross-device support. But it’s more of an authoring tool than an organizational tool, although it has support for some organizational tools such as tagging. It’s essentially a very thin theme on top of Markdown, though; it isn’t really WYSIWYG and the Markdown formatting is visible. Write looked at first like what I needed: a Markdown editor that would work with files in Dropbox or any other cloud sync provider. But when I investigated it, it didn’t seem to be very reliable or well-implemented. Dropbox Paper is kind of like a lightweight Google Docs that works on Dropbox, but it doesn’t work offline and the data isn’t stored inside of your Dropbox account. The data is separate, and the relationship with Dropbox seems to be only a high level of integration with your account, not your data per se. Simplenote is a very simple, free, and opensource app that supports Markdown. 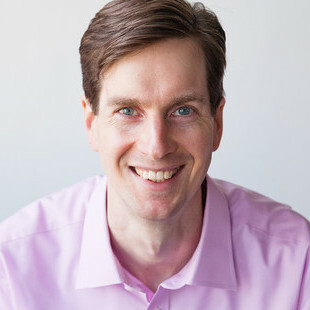 It’s cross-platform, and the data is stored in their SaaS service. The product is provided by the makers of Wordpress. I found it to be a little too barebones, although it’s simple and lightweight. For example, some of the client applications displayed Markdown in plaintext, although the web app showed it formatted. All-in-all, I found it to be most similar to Bear Notes, but Bear was slightly better. Bear Notes is the option I eventually used for a while. 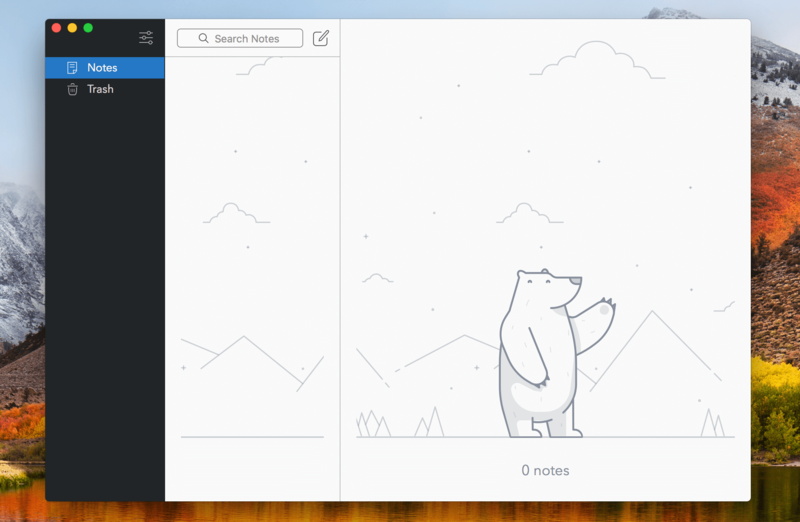 Bear Notes is a note-taking app that is essentially a thin veneer on top of Markdown. It uses iCloud for syncing content between devices. 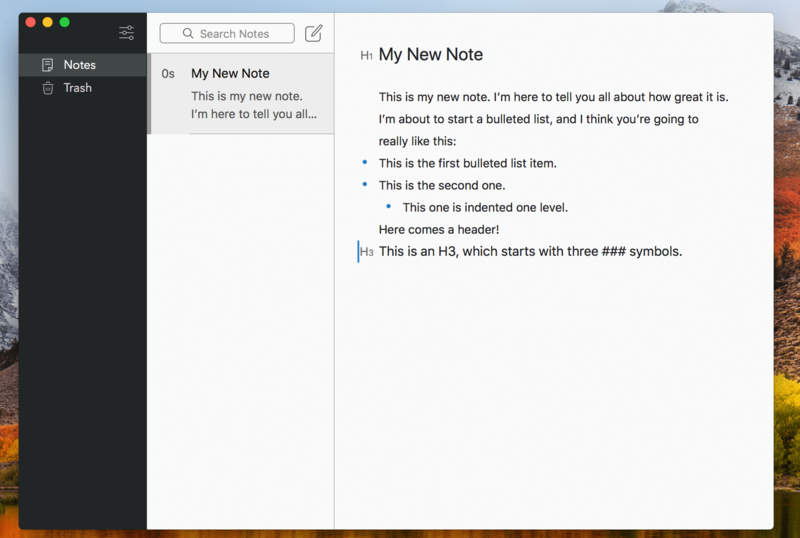 It’s not too different from the Mac/iOS Notes app in some regards, but is definitely lighter and less bloated. I stopped using Notes, and used Bear exclusively for a few weeks, migrating notes over from the Notes app as I found I needed to update them. I found myself liking Bear a lot. Its interface has a lovely aesthetic, and it feels pleasant and unobtrusive to use. Its search works very well, and it doesn’t have a lot of features, so it is very simple to use. It has a web browser plugin to help clip web content into notes, which I do a lot. I liked that it uses Markdown under the hood, although by default it uses a variant on Markdown and has to be configured to use standard Markdown. In fact, the Markdown is only about half-hidden; it feels like only a slight step up from writing Markdown with good syntax highlighting. That turned out to be one of its flaws, to tell the truth. Some things about it bothered me a lot, especially some of the design and typography choices. For example, headings and bulleted lists didn’t indent as I’m accustomed. They outdent the formatting symbols past the left margin of the text, which makes it feel like the formatting is distracting from the content. When I create a bulleted list, I really want the list to be set off with indentation to help emphasize the cohesiveness of the list in contrast to the surrounding content. Here’s a couple of screenshots to help illustrate. First, here’s the Bear interface without any notes, to show how simple it is. Notice how the list isn’t indented, and the bullets are outdented? Notice how the cursor is off the left edge of the document in the heading? Little things like that add surprising cognitive load to using the app. Here’s an example of a task I do a lot: I put my cursor at the end of a line and hit Cmd-Shift-Left to select the text to the beginning. In Bear, this copies more than the text, it copies the formatting too. It surprised me every time I did it, and never stopped being surprising and slightly jarring. Another example is the extra space between the title and first line, which you can’t put the cursor into. It feels like groping for something in the dark. The app’s copy/paste behavior is actually one of the biggest issues I had with it. Although it looks like it’s formatted text, it isn’t: when you copy and paste into another app, all you get is plaintext with asterisks and other formatting codes. I copy and paste between apps a lot, and I want things I copy from my notes into my emails to have the right formatting. In Bear, I’d have to export the content to get it into HTML, open that in a browser, and then copy from the browser. I know copy/paste is probably messy under the hood, but the experience with Bear was jarring compared to other apps I’ve used. Finally, syncing was frustrating. There’s no support for conflict resolution. If I edit a note on two devices offline and then bring them online, I get two notes with conflicts, and now I have to resolve the differences between them. Most other note-taking apps I’ve used have figured out how to merge updates. Even if there ends up being some amount of conflict or messiness in the text, that’s a lot better than having two notes with slight differences I need to resolve. Bear isn’t up to par here. In the end, I gave Bear a few weeks and then canceled my subscription. The less-is-more aesthetic of the app was appealing, but it felt like I was coming up short on some features I needed to work better, and I had problems that felt similar in complexity and effort to more complex note-taking apps, which kind of negated the point. It looked like I was going to have to use something a bit less minimalistic. Ability to replace Pocket. I have a premium subscription but have never been fully satisfied. I’ve used it for years and saved thousands of articles, and reported bugs tens of times, and they just don’t seem to fix the bugs that mangle the content I’m trying to save. I’d like to be able to consolidate my “read it later” list with my notes and keep my whole digital memory in one place. Platform independence, so I don’t get stuck in a dilemma if I decide to use an Android phone or tablet in the future. Good integration with other tools I use, such as a browser extension and Feedly integration. Google Docs: I love Google Docs, but they don’t work well offline, and they’re a word processing app, too heavyweight. And, a notes app should be in a single UI, with an information hierarchy and navigation between notes in a menu or sidebar; Google Docs are standalone and aren’t contained within a single good UI in that way. Google Keep: I tried it but found it very poorly done. Saving an article into it, for example, doesn’t save the article’s text. It just saves the link. If I wanted bookmarks, I’d use my browser. It also doesn’t work offline. Microsoft OneNote: Other people seem to love it, but I can’t fathom why. Evernote: this is the option I ended up choosing, and I’ve been very happy. I had a prejudice against Evernote: I thought of it as bloated, complex, slow, and buggy. But my wonderful wife has been using it for a while, and she was happy with it, so I took another look and found I was mostly wrong. First of all, it does satisfy my wishlist: I can use it as a Pocket replacement, I can store my whole digital note-taking and information-hoarding life into it, and it has a browser extension and article simplifier that’s better than Pocket’s. And it’s platform-independent and is unlikely to go out of business in my opinion. When I tried it out, I was pleasantly surprised. It’s not bloated or slow; quite the opposite. It’s much faster and easier to use than Notes. It does have almost every conceivable feature and interface option, but they are designed well so they’re not intrusive, and the user experience feels clean and pleasant. Sync worked a lot better than I’d been prepared for, too. I’ve had an issue with a note that wouldn’t sync, and the user interface errors were confusing, but when I looked into the activity log I found it was an unreachable URL in that note. Why this was preventing it from syncing I’m not sure, but fixing the URL fixed the sync problems. Like Bear Notes, it doesn’t resolve conflicts very well, which can be tedious. There’s no keyboard shortcut to add a link to selected text on my iPad. This is out of character: there’s generally “just the right” functionality I need, but the iPad has shortcuts for everything else I don’t need, and not this one. In fact, I couldn’t find how to hyperlink text on the iPad version, with or without keyboard shortcuts. The Mac desktop version doesn’t seem to persist some of my settings after restarts and upgrades. It’s as though I haven’t used the app before: when I restart the app, it offers me a feature tour and enables features I’d disabled previously, such as Context. Importing notes by using copy/paste wasn’t very good. Bulleted lists didn’t come over as multiple bullets, but as line breaks with bullet characters. See below for how I imported the notes programmatically with better results. Careful readers will have observed that I seem to be holding Evernote and Bear Notes to different standards of excellence. Why was it frustrating for Bear Notes not to resolve sync conflicts, but acceptable for Evernote? I’m honestly not sure; there’s bound to be some psychological effects at work here, some kind of bias. I’m valuing things differently, I recognize that. It may be that Bear Notes has a different feeling and aesthetic, and that sets a different standard for what feels frustrating to me. set myNote to create note with text myTitle title myTitle notebook "Imported Notes"